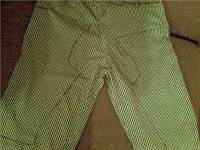 I made a pair of 3 seam split crotch pants for Charlie (link for pattern) I used an old pair of pants they are checkered. This is the pants ready to be sewn up. Here is charlie modeling them when i popped them on him to check sizing etc.the split will actually be smaller and not as noticeable he was just wearing a very bulky nappy. This is a newborn jacket (more pics of it here)I was thinking Charlie.I was thinking it could be made with jumpers or even t-shirts.Not sure what I'd use to line it if i wanted to make it a warm jacket as fleece gives charlie a rash. This Jacket (found here) has got me thinking about making some for Cody &Tyson.I was thinking a XL(or bigger) Man's jumper could be enough material for the outer and a same size man's tshirt as lining on the inside. I love this jacket (here).as you can tell mostly winter type clothing is my inspiration at the moment. 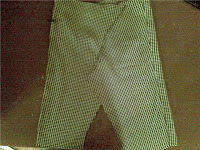 also found these pants (here)going to make some for tyson & charlie. for those needing ideas on where to start in recycling clothes i found some great tips/ideas here . 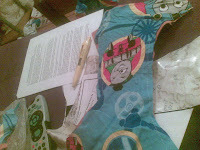 Now I have 3 boys so i dont get to make dresses often but i love these dresses(here)they are made out of tea towels! 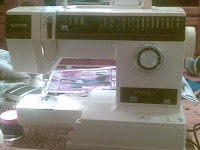 Gwenda(allan's mum) trusted me with her very old but awesome sewing machine its older then me and runs so smoothly.Its about 27yrs old. 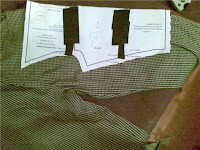 Anyway,I have been sewing tonight i made a tester pair of training pants to gauge the sizing of a pattern for charlie.It looks like they will fit yay.I used scrap fabric and elastic in my big box of mystery. Well the dye didnt take to the skirt as i wanted it to. it turned out a bit faded how do i get the vibrant purple i desire?? i recently joined burdastyle.com such a great site for inspiration and freebies. its inspired me to make a few things. i have so many patterns to print out haahahah. I am re-doing charlie's room giving it a bit of a makeover. its going to be sort of waldorf inspired and fairytale themed but still boyish.I just have to sand a cot some drawers and recolour them,the cot is currently painted white,so are 1 set of drawers,the other drawers are ready to be stained.Im hoping to get a jarrah colour then it will match the toddler bed. Well I am dying a white cheesecloth ankle length skirt. I think purple will look nice. 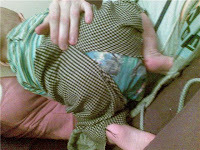 I have to take the elastic out too,the waist band streched a tad while I was pregnant. 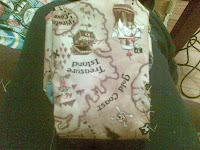 So I am going to make it a drawstring skirt. Also,jazzing up a much loved pair of jeans.I plan to cut off the legs from the knees and attach some printed fabric. Will post photos once I'm finished,who knows when that will be with 3 boys under 4. I _____jess_____________ pledge that I shall abstain from the purchase of "new" manufactured items of clothing, for the period of 2 / 4 / 6 months. I pledge that i shall refashion, renovate, recycle preloved items for myself with my own hands in fabric, yarn or other medium for the term of my contract. I pledge that I will share the love and post a photo of my refashioned, renovoted, recycled, crafted or created item of clothing on the Wardrobe Refashion blog, so that others may share the joy that thy thriftiness brings! Signed_____jess_____________. I am a 23year old mum of 3 boys. Cody is 4yrs &3months old. Tyson is 2yrs 8months old and charlie is 9.5months old. Between going crazy and relaxing i try EC,homeschooling,babywearing and try to minimise my carbon footprint.